Reverend (Dr.) Bob Kopp led the school prayer blessing for the new school year in downtown Belvidere. 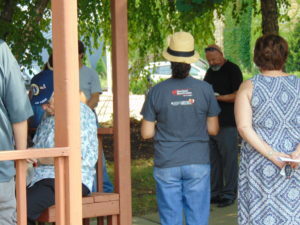 A Back to School Prayer Event was held in Hub Plaza near the town clock on the warm Sunday afternoon of Aug. 19. Over 30 people gathered together at 3 p.m., and more trickled in throughout the event, to pray for the students, parents, and school staff – teachers, coaches, administration, custodial staff, bus drivers, cooks, etc. – regarding their health, safety, and well being throughout the new school year. The reasoning behind this was that gatherings are always held when tragedy strikes, but a gathering to pray safety over the schools to prevent tragedy is just as important. Make a preemptive call for safety and wisdom for all. -Physical, intellectual, and emotional growth and stability, excellence in all staff and students. -Growth in wisdom, love, sensitivity, and fairness to and for others; kind social interaction in all of life. -Thankfulness for creativity and for opportunities for each child to develop their God-given talents. -For your child(ren)’s teachers by name; for insight and wisdom into each child’s needs; for patience, perseverance, and encouragement. -For each classroom environment to be warm and inviting. -Physical safety; God’s protection of all students, teachers, school buildings and properties from disease, weather, man-derived evils. -A special anointing on all special education classrooms, students, and staff. -School administration and school board decision-making, wise curriculum choices. -Abundant provision; wise usage of all resources. -Empathy and compassion for others to reign in every classroom; learn kindness and control of their tongues. -Peaceful environments conducive to learning; peace within each child and staff member, no fear. Shalom. -Appropriate, God-pleasing materials and curricula in every classroom. -An awareness and aversion to unhealthy/immoral habits, speech, and behavior. -Healthy cooperation between administration, teachers, staff, and property. -Timely revealing and resolution of anything potentially harmful to students, staff, and property. -Parents and guardians to respect, honor, and show thankfulness to school staff. -Godly men and women of integrity to be placed in all positions of our schools, role models who connect with our children. -Respect for authority, good mentoring opportunities. -Good communication between schools and school families. -Motivation of students to do their best, laughter and joy in the halls and classrooms. -All Belvidere schools to provide excellent education suited to each child’s needs. -Relevant after-school programs and opportunities, including faith-based programs. -Opportunities and openness for parents and community members to be participants in our schools. -Access to and proper use of technology in our schools. -Insights into and guidance for each child’s future endeavors; increased graduation rate, good citizenship. -Good and appropriate discipline/intervention when necessary. -Effective communication on all levels. -Quick recognition of any situations needing intervention; God-given wisdom. -Thanksgiving for God’s abundant blessings though Jesus Christ.